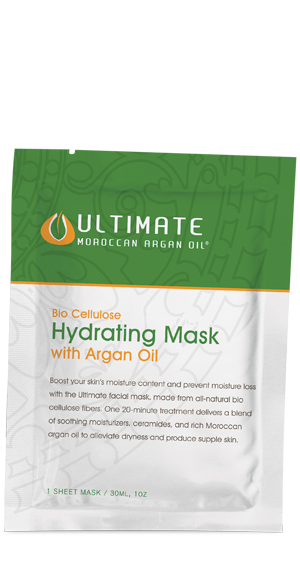 The ULTIMATE Moroccan Argan Oil� Hydrating Facial Mask significantly boosts your skin�s moisture content and helps prevent moisture loss. Its unique bio cellulose fabric binds tightly to facial contours and transfers skin care ingredients more efficiently than any other mask. In one-20 minute application, dry skin will be quenched and supple, radiant skin will be restored. Cleanse skin gently. Remove mask from packet. The mask has three layers. Separate the bio cellulose fabric (middle layer) from its protective layers. Align eye, nose, and mouth openings and begin applying mask. Make certain that the mask seals tightly by repeatedly smoothing fabric from center toward its edges. Two slits at mask bottom help mask contour to jaw line. With mask in place, relax 20 minutes until ingredients are absorbed. Skin will feel cool, refreshed, and appear luminous. If ingredient residue remains on skin, massage in gently. Extra serum in the foil pouch can be saved and used as a moisturizer.